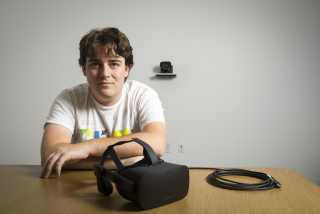 Just ahead of the Oculus Connect 2 event held last month, we had the opportunity to sit down and speak with Oculus founder Palmer Luckey. In our 12-minute interview, we cover a variety of high-level topics. In the discussion, Luckey gives us the status and outlook for VR. In the near future, he believes we will see an explosion of people using VR, and tons of VR games in development. Is it likely that VR might be just a niche product? Luckey asserts, “Virtual reality will be a niche product for at least some time,” then added, “If you look at the Palm Pilot, it’s sort of a good example. The Palm Pilot was very well known. It was very influential, but it wasn’t something everyone wanted to use or could justify. They sold millions of units and lots of people recognized Palm Pilot as a great brand, but you could say the Palm Pilot was [still] a niche product… Eventually the technology got good enough, the cost came down enough that we had things like the iPhone, where it really took off and everyone could justify having the tech in their lives. I think virtual reality will be on the same continuum. It can be successful as a niche product. It doesn’t have to be mainstream and appeal to everyone in the world in order to be successful, but that is the eventual end goal; to build something everybody will have a use for. I think that virtual reality will inevitably have a use for everyone because anything you can imagine of doing in real life, you can do as good or better in virtual reality without physical laws governing what you can do.” Palmer then cited travel, education, and even virtual past time travel as examples of what VR could do. “We can’t [virtual time travel] with any other technology,” he exclaimed.